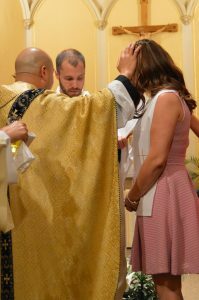 RCIA is the Rite of Christian Initiation for Adults, it has been a process for people to become disciples of Jesus and members of the Church since the 300’s A.D.! There is a long history of RCIA at St. John parish, and for most of those years the format followed was the traditional classroom approach. In most parishes in the United States, RCIA starts in the fall and ends shortly after Easter. If someone decided they wanted to become Catholic in February or March, they would have had to wait until the next fall to even begin. Some people have done many years of extensive study on their own, they may have been attending other denominations or even the Catholic Mass for years; they may enter an RCIA group in the fall alongside a person who has never set foot inside a church building and doesn’t know the basic Bible story. Because of this, and many other reasons, we are offering Year Round RCIA. RCIA is not a class. No one graduates. We do not have to have a conveyer-belt system where one size fits all. Each person will be treated individually, with the Rite of Acceptance / Welcome celebrated a few times during the year, bringing them into the process of the Catechumenate (the stage of learning) at different times. The learning and “class” component of RCIA will be woven into our faith formation life of the parish. Every year there will be multiple Alpha Courses that will serve as the Period of Inquiry, RCIA participants will have their own small group, with the Hosts and Helpers as part of the RCIA team. Then throughout the year, adult ed offerings on the Sacraments, Bible, Prayer, basic doctrines, etc. will be offered. Anyone can attend, but portions of those presentations will target the RCIA candidates and catechumens. They will break off into another room to review, discuss and debrief, while the other adults can then dive deeper into the topics and discussions. Our approach may seem messy and confusing on a calendar. 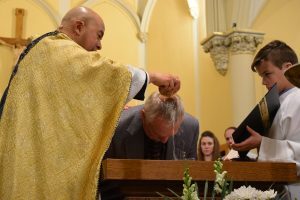 However, this gives the candidates (those who have been baptized previously) and catechumenates (those unbaptized) as much time as they need before jumping into the later steps. No matter what time of the year, when someone makes an inquiry, they will meet with a staff person and prepare to attend the next Alpha. After that they will begin attending the adult formation programs and RCIA small group break-outs. When it is determined that they are sufficiently prepared, they will continue forward with the rites heading toward Easter. RCIA could take as little as 3 months for someone well studied, attending Mass, and already intentional about their faith journey. Or it could take two or three years before the person is ready to make the final commitments to the Sacraments and the Church. Most people take about a year. No matter the details, we will journey alongside you. Have questions? Interested in learning more or joining the church? Contact Todd Gale.